Morning Parade’s self-titled debut has already created some buzz overseas and promises to make waves in the U.S. as well. The five piece alt-rock band from Harlow, Essex was featured on The Vampire Diaries’ soundtrack, and now we get a full taste of what the band has to offer. The album starts out strong with the fist-pumping “Blue Winter.” This is followed by “Headlights” – a track with great potential. 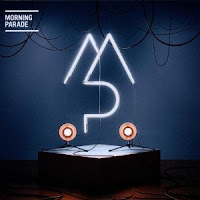 It appears that Morning Parade have mastered the art of crafting a good tune because “Carousel” is a radio friendly anthem that will be stuck in your head for days. The band heads into ballad territory with “Running Down the Aisle,” and the addition of piano adds a nice atmospheric touch. The grand chorus of “Us and Ourselves” calls to mind 30 Seconds To Mars’ “Kings and Queens” and the high energy of “Under the Stars” is balanced out with shimmering synths and driving rhythms.